Betsy Devos Sued For Blocking Student Debt Relief - Joe.My.God. Despite a court order voiding efforts to delay Obama-era student borrower protections, the U.S. government continues to collect money from borrowers who are entitled to automatic debt relief, a consumer advocacy group claims in a new lawsuit. In September, a federal judge in Washington D.C. found the Education Department’s delays in implementing the rule unlawful. One month later, that same judge – U.S. District Judge Randolph Moss – denied a for-profit college industry group’s motion for an injunction to block the Borrower Defense rule from taking effect. Despite those recent setbacks to Devos’ agenda, the Education Department secretary continues to ignore part of the Borrower Defense rule that requires automatic debt relief for certain students. The automatic provision mandates full and automatic debt forgiveness for those whose schools closed on or after Nov. 1, 2013, following investigations of deceptive marketing and predatory practices. The new complaint was filed by the Housing and Economic Rights Advocates, a California-based legal service nonprofit group. It claims that the Department of Education is continuing to collect on loans that it should be discharging under an Obama-era rule. 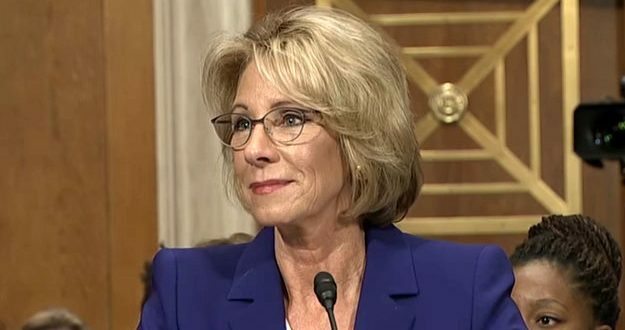 “Under current leadership, the Department of Education seems determined to deny student borrowers the financial relief to which they are entitled,” said Aaron Ament, the president of the National Student Legal Defense Network, which is helping represent the plaintiff. “The students we are trying to help have been doubly victimized — first by the for-profit colleges that deceived them, and now by the federal government that refuses to help,” Ament said in a statement. Sign up for the JMG Newsletter!